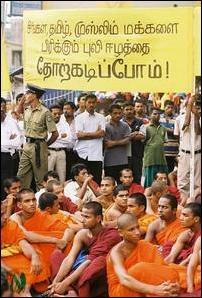 Buddhist monks sit down and protest under a banner in Tamil that says LTTE should be defeated. The demonstration and protest march started in front of the Buddha statue at the Viharemhadevi Park in Town Hall and the march reached the Bo tree at Colombo Fort. 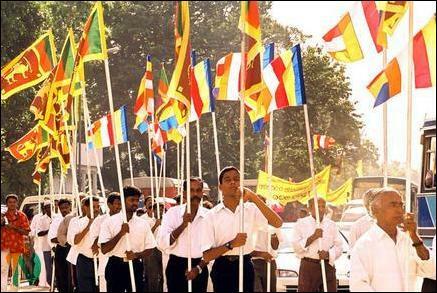 The demonstrators carried banners, Sri Lanka’s national flag and Buddhist flag, ands protested the ISGA proposals, saying the LTTE should be defeated and its proposals should not be considered at all. Civilians also marched in the procession along with the monks. When the procession reached the Bo tree, the monks and other protesters sat down under the Bo tree and started Buddhist worship against what they said was ‘handing over’ ISGA to the LTTE. The NBF’s leader, Ven. Kalavalgale Chandaloka thera, speaking to the press said, "We plan to hand over a petition signed by 3000 monks to the President, Chandrika Kumaratunga, against the handing over of Interim Administration Authority to the LTTE." Some of leading monks of Buddhist society, including Ven. Madiyathila Vijith thera and Ven. 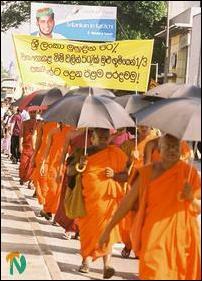 Bengamuvay Nalake thera participated in the demonstration. 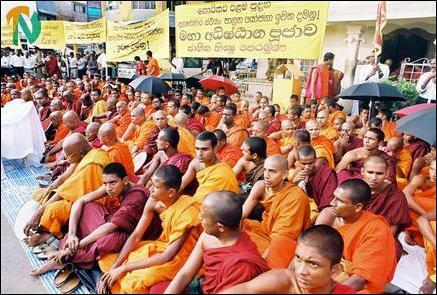 Buddhist monks sit down and worship against protesting the Interim Self Governing Authority proposals by the LTTE. Ven. 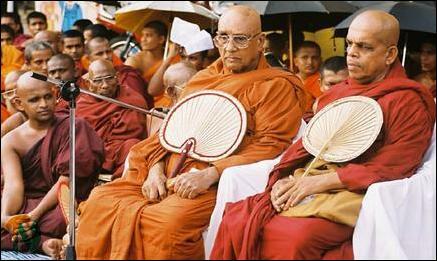 Bengamuvay Nalake thera(R), Ven. Madiyathila Vijith thera(C) and Ven. Kalavalgale Chandaloka thera (L) participating at the demonstration seen worshipping.